Indian food is seriously diverse – you may already know that South and North Indian foods are two entirely different cuisines, but to split the difference even further, each cuisine has different ethnic foods, different dishes, so on and so forth. Also, it doesn’t help that Singaporean Indian food can be very different from that in India itself. So to rank these places according to how good they are is like trying to compare chicken and duck rice; it’s simply not a fair fight. 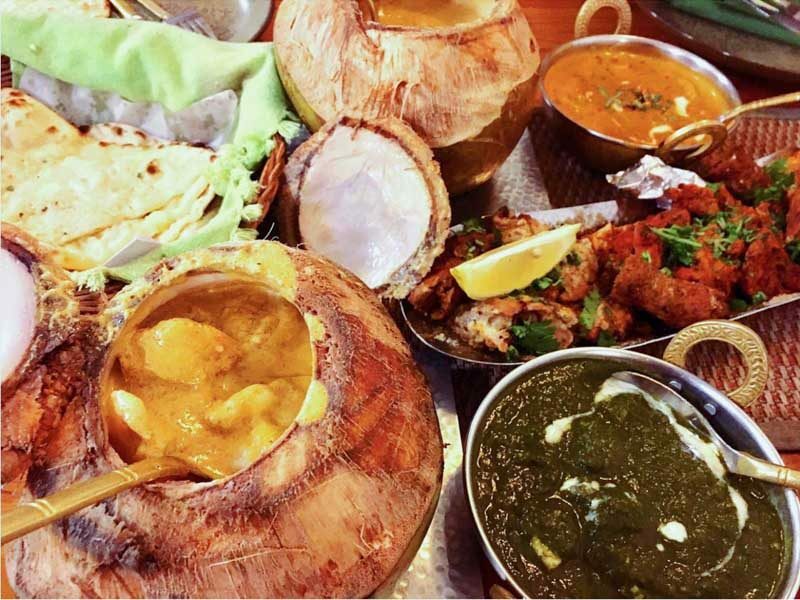 Instead, here’s a list of 10 Indian food places in Singapore that serve a variety of Indian dishes and have received great recommendations and reviews. Enjoy! I’m starting this list simple, with the one Indian food that all Singaporeans know for sure: Prata. 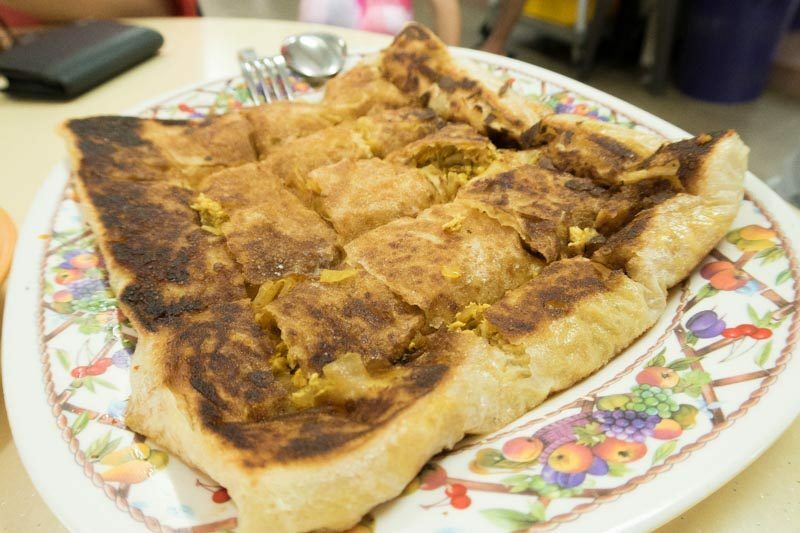 Sin Ming Prata is kind of the epitome of what a good prata should taste like. 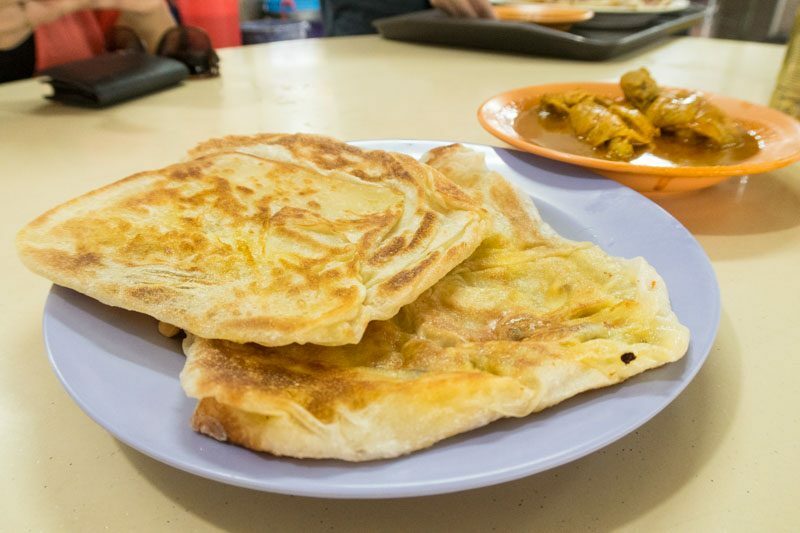 Imagine prata that is crispy on the outside, but has flaky layers on the inside that stick to your tongue. The curry is spicy but also mildly tangy and sour, the way it should be. The price is also great, at only $1 for a plain prata and $1.50 for one with egg. If you’re feeling famished, get the Murtabak ($7) which is served piping hot, and emanates the aroma of Indian spices. Next, let’s take it up a level. South Indians often eat rice with curry and various side dishes, kind of like an Indian zi char, if you don’t mind me saying so. 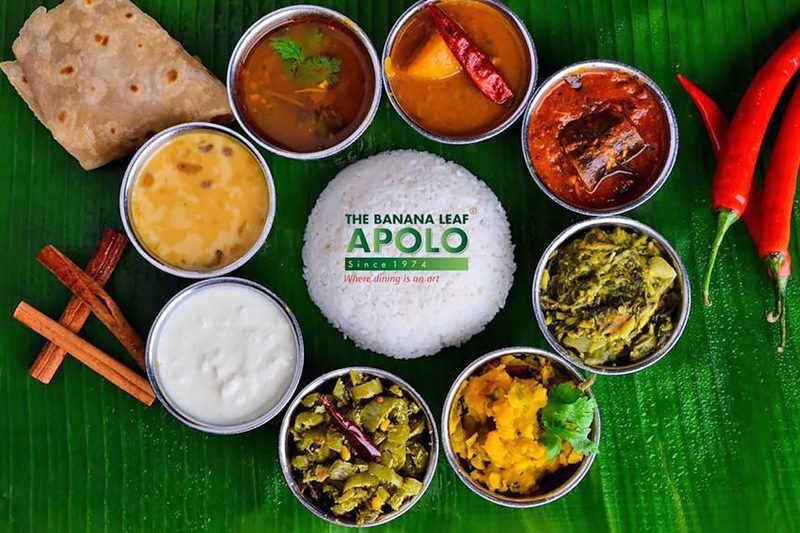 Banana Leaf Apolo is where you can get great Indian mixed rice. It is very popular among Singaporean Indians, and for good reason. The food is tasty and similar to home cooked food, and the price point is reasonable. The standard fare would be to get your rice with some gravy, curried chicken, vegetables, and maybe a boiled egg. But if you feel a little bit more adventurous, try my personal fave of white rice mixed with yoghurt and cucumber, fried fish, and papadum (fried seasoned dough). The rice will be tangy and cold, but it goes amazingly with hot fried fish. We’ve talked about prata and mixed rice, now let’s talk about curry. 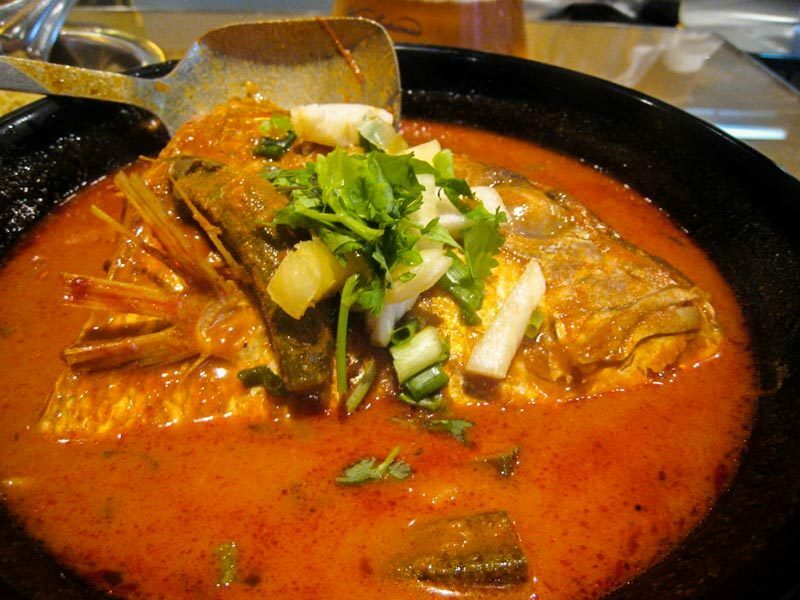 Muthu’s Curry arguably has the best fish head curry in Singapore. It also has mixed rice like Banana Leaf Apolo, but it is better known for the fish head curry that is spicy, aromatic, thick, and sure to leave your mouth tingling long after. Go for it if you are a fan of big, strong flavours, as the fish head infuses a lot of the taste into the curry. The curry costs $22/$27/$32 depending on the size, which is a little pricey, but worth the taste. Next, we have some Brahmin cuisine, which is vegetarian and uses a lot of grains other than rice. 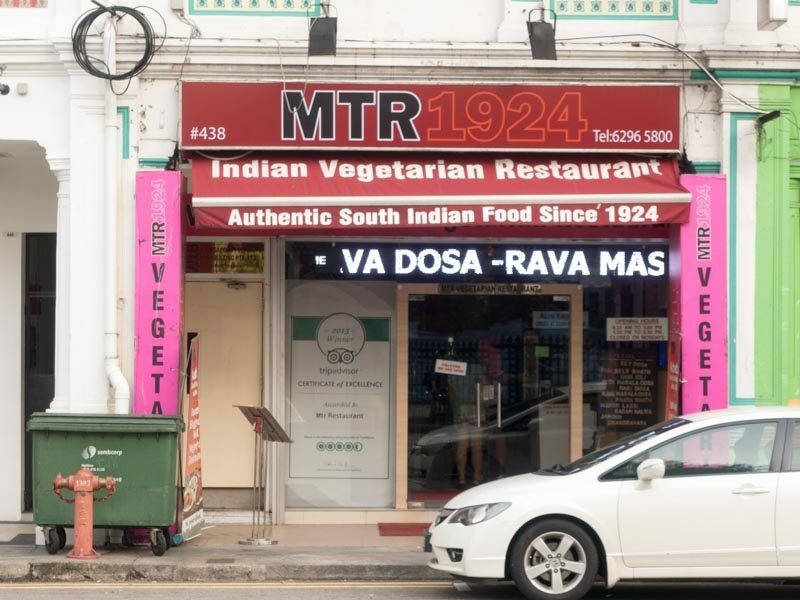 MTR1924 is known for its crispy dosas (something like a savoury crepe) that are stuffed with potatoes and eaten with various chutneys (sauces made with coconut). 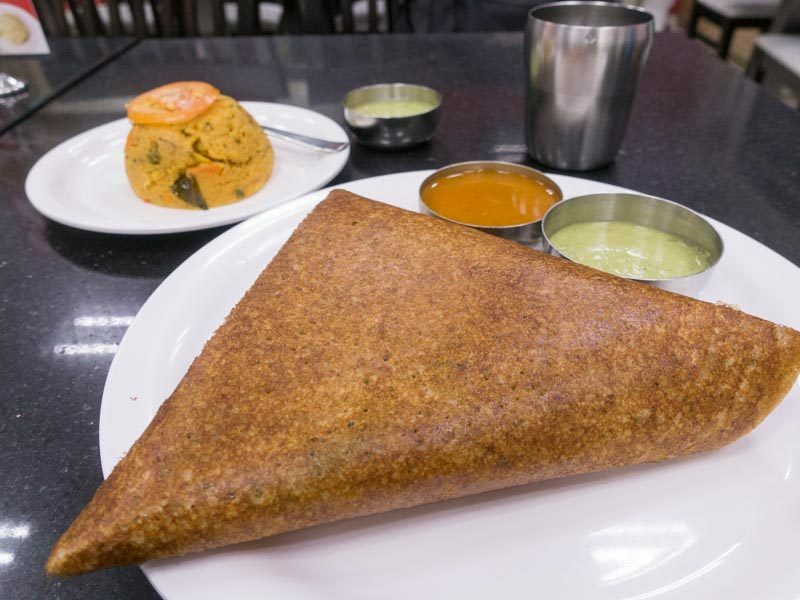 With a Masala Dosa ($6) you can expect the thin and crunchy skin to break apart and reveal a pillowy crepe that cradles hot and spiced potatoes that have been diced. It is texturally amazing, and rich in flavours. 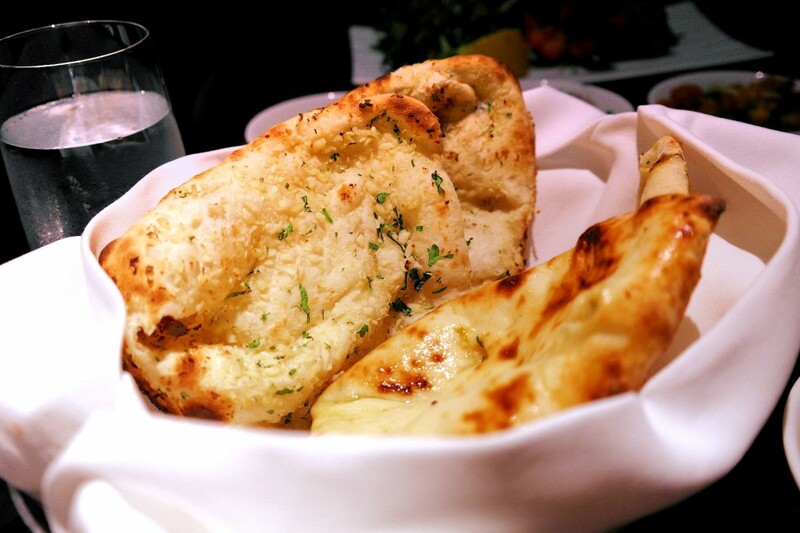 The mint chutney is the best dip, as it will refresh your palate while complementing the main. Don’t forget to also order the Rava Idli ($4), a platter of steamed and fluffy semolina cakes that are mixed with coriander, curry leaves, mustard seeds, and cashews. They are always served incredibly hot and are so satisfying to sink your teeth into, after dipping one generously with the chutney provided. We’re almost halfway through this list, and we’ve covered some authentic Indian dishes from around India. 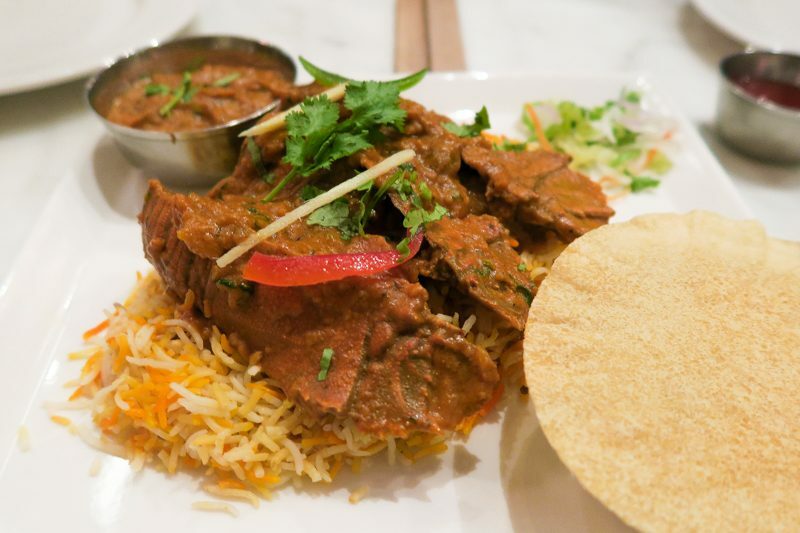 Now I’d like to talk a little bit about Singaporean Indian eateries, which take authentic Indian flavours and add a contemporary local twist to them. 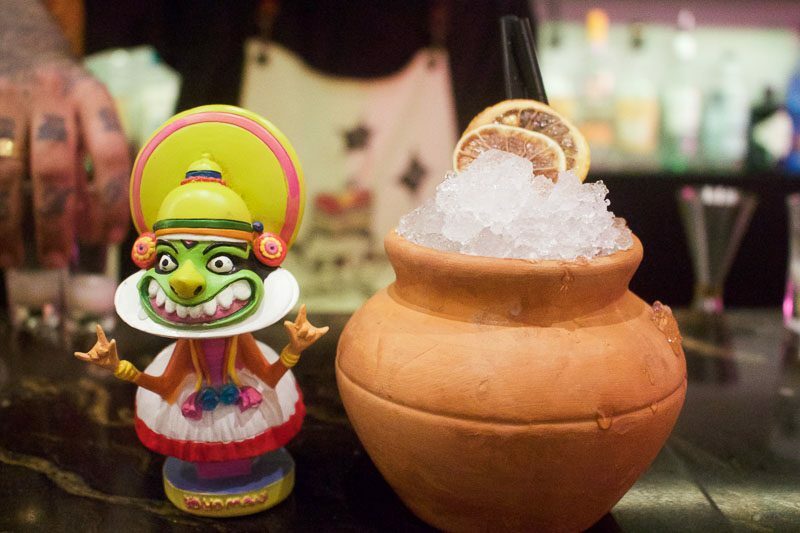 For instance, Flying Monkey, which creates fun alcoholic beverages using Indian ingredients and props like clay pots. I don’t know if other Indians would call this blasphemous, but as far as I’m concerned, it’s really cool to have a drink inspired by my culture. If you don’t mind spending a little more on unique drinks, you should give the Yo Yo Mani ($18, pictured above) a try. It is a tropical drink with a rum base and an added touch of coconut and five-spice Kerala rice syrup. It is potent and has a strong taste of coconut and milk. I enjoyed drinking the concoction, but I wish there was more drink than ice. 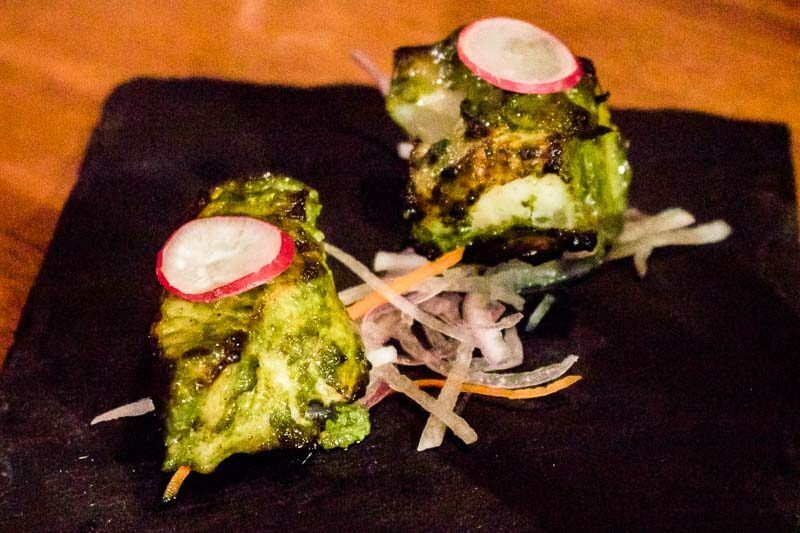 Flying Monkey also serves some delicious tapas including the Tulsi Cod ($15), which is charred in tandoori spices and served with a caramelised skin and flesh that just melts in your mouth. 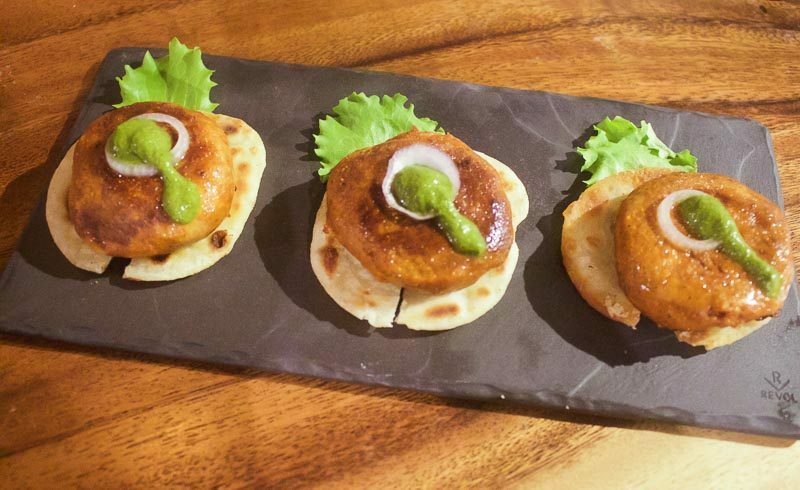 If you love lamb, get the Galouti Kebab ($14), which consists of minced lamb that is marinated with unripe papaya, before being served on tiny crackers. 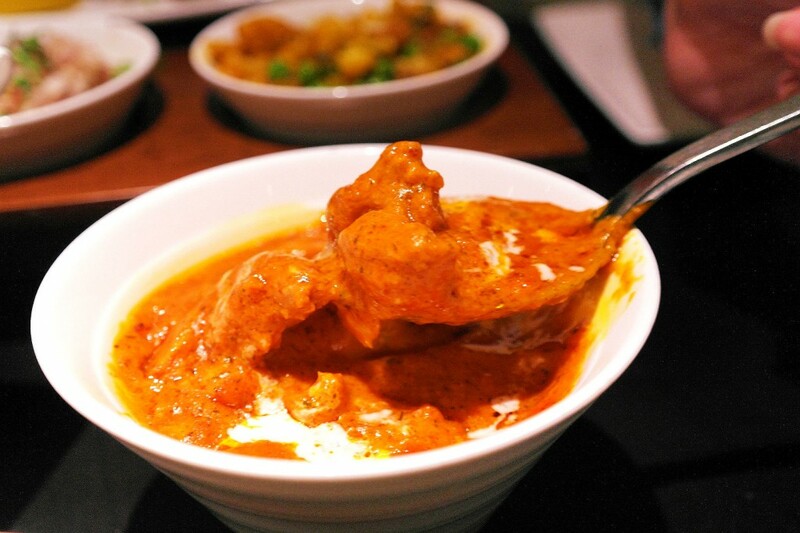 It is very gamey and true to the powerful flavours you’d expect from Indian dishes. 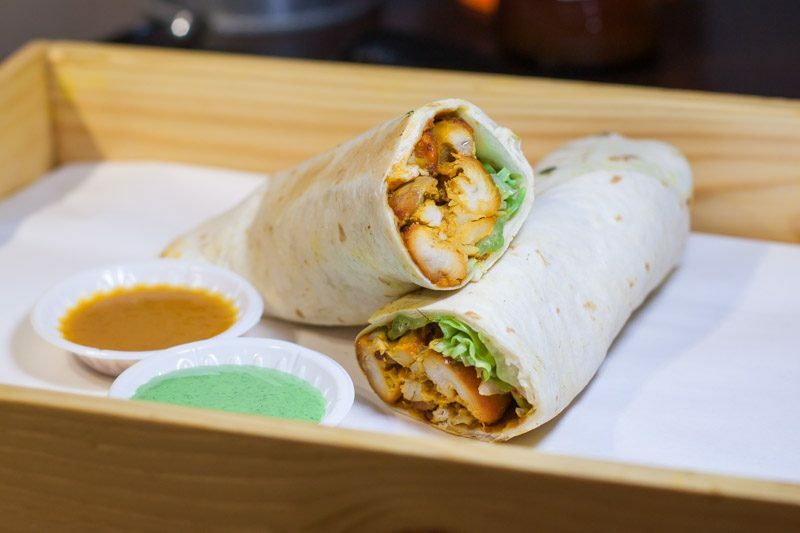 Speaking of Indian food with a twist, here’s an Indian cafe that is dedicated to excellent kebabs. There’s a little bit of a crossover with Arab cuisine, but I’m willing to overlook that, given how there are dishes like Garlic Chicken Tikka ($11) and sides like Masala Fries. The kebabs here are seriously jammed with meat. We’re talking about an 80% to 20% ratio of meat to vegetables. And with all of those dry ingredients crammed into soft rolls, you’ll especially enjoy dipping your kebab into the juicy and flavour-packed sauces that are made in-house. 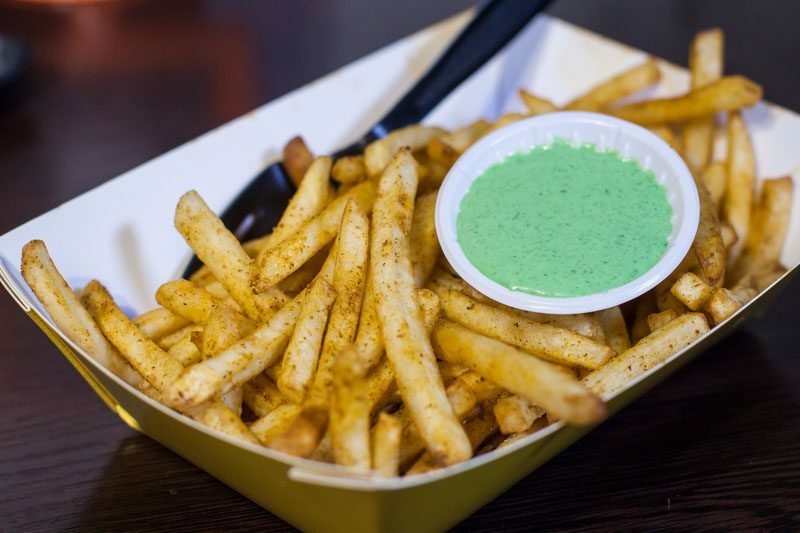 Complete your meal with Masala Fries that are a lovely smoky and spicy alternative to the more common truffle and cheese fries you’ll find everywhere else in Singapore. Just make sure you dip them into the mint sauce for a whole other level of yummy goodness. Oh, and if you enjoy an ice-cold beer with your meat, you need to get the Hoegaarden Wit Blanche ($10 during Happy Hour) with the Garlic Chicken Tikka ($11). Amazing comfort food. 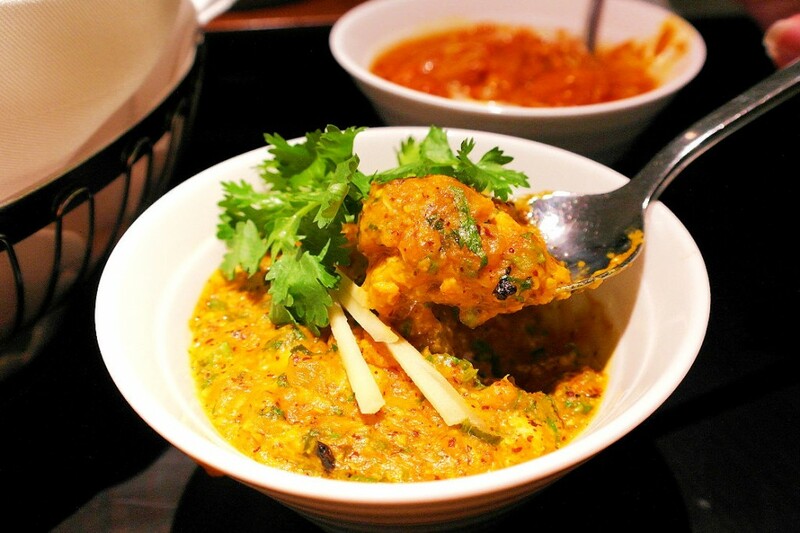 Mustard is a Bengali and Punjabi restaurant that is known for tasty food at affordable prices. Located in a small unit space along Race Course road next to some of the bigger names, Mustard is kind of a hidden gem that is sometimes overlooked. When at Mustard, you can’t miss the Coconut Prawn Curry ($18.90) that comes served in a giant coconut, with huge prawns that are sure to satisfy. For some homely dishes, get the Dal Tadka ($11.90) (a creamy lentil curry), or the Aloo Gobhi ($12.90) (a cauliflower and potato stir-fry) that will have you wishing all your vegetables were cooked to such spicy and fragrant perfection. Zaffron Kitchen has a Michelin Star, and a lovely interior to accompany the quality food served here. The flavours are more palatable for non-Indians as the food is not overly spicy or sour, but delicately tasty. 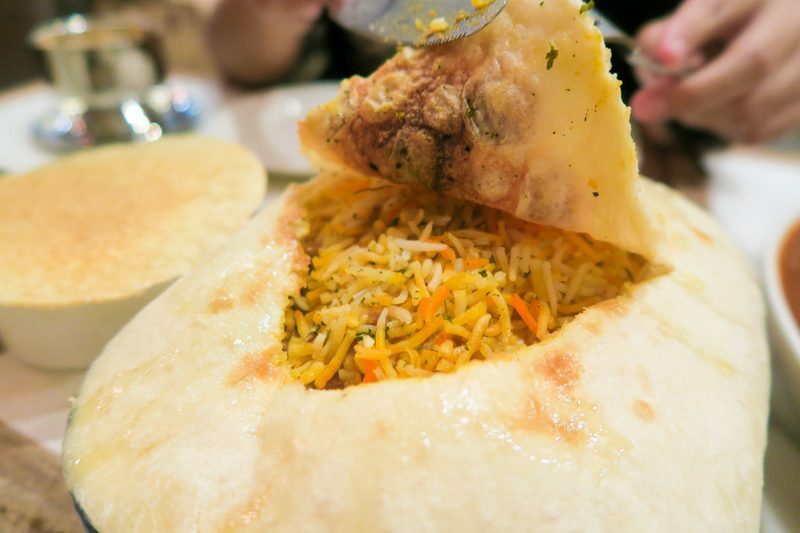 When at Zaffron Kitchen, order the Dum Biriyani ($16), which is cooked with a pastry covering the rice. The experience of eating biriyani rice with pastry and curry was a lot nicer than eating it alone. The Crayfish Biriyani ($21.50) was also very enjoyable with the succulent flesh of the crayfish adding another dimension of flavours and textures to my biriyani. 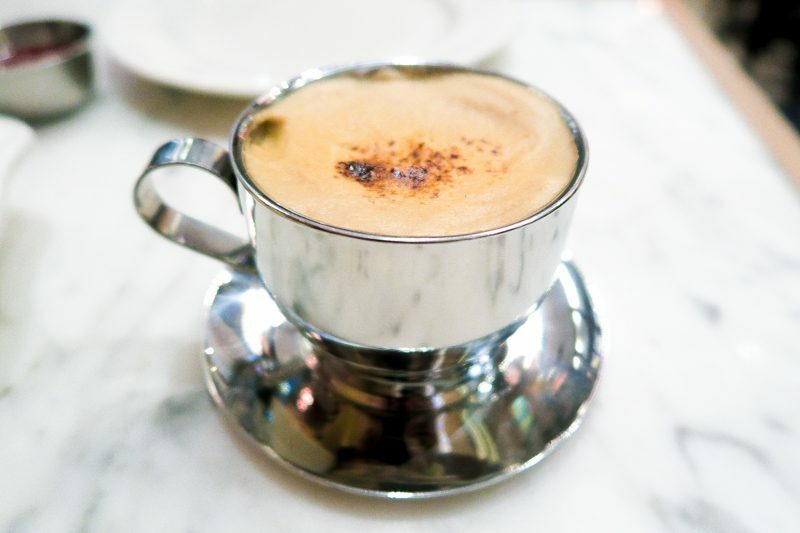 Finally, do not leave Zaffron Kitchen without ordering a cup of Bru Coffee ($5), an Indian coffee brand that is extremely strong, fragrant, and mildly spicy, for a thoroughly satisfying end to your meal. One of the posher Indian restaurants in Singapore, Table by Rang Mahal offers both North and South Indian cuisines without compromising on quality. Try the Butter Chicken ($18), that has tandoor-grilled chicken simmered in a homemade tomato gravy, and mop it all up with some pillowy Indian Tandoori Naan ($5), for a combination that will warm you up and put a smile on your face. If you don’t want chicken, get the Bengali Fish Masala ($22), which comprises of sea bass fillets tossed in mustard and spices. The soft and fresh fish retains a slight firmness and is elevated with a good mustard sauce that has a hint of sourness and an adequate spice level. I’ve put Annalakshmi on this list not just because the food is nice, but also because it’s a non-profit restaurant. Patrons who come here can eat as much as they want and pay any amount. The concept is like this so that people who are going through a hard time can enjoy a proper meal without going broke. If you feel like giving back, you can pay a sum that’s higher than usual, too. 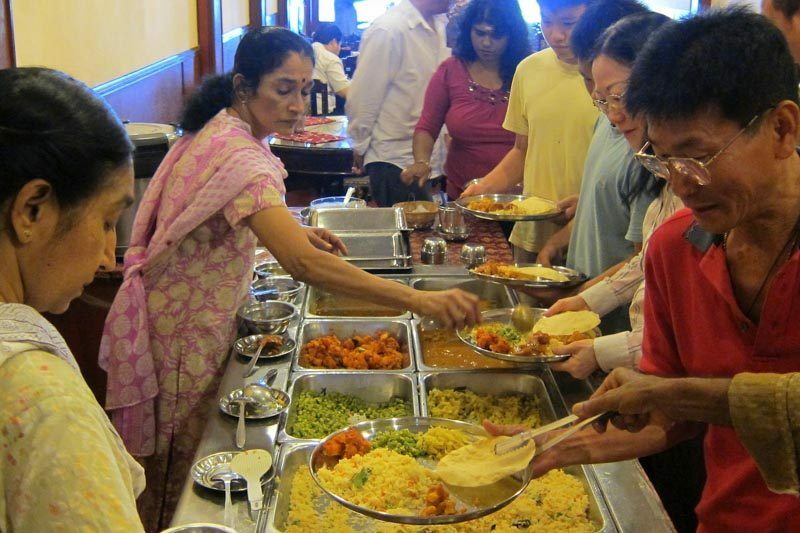 The food here is generally South Indian, and comes in a buffet-style, so you can help yourself to your favourite dishes as much as you want. 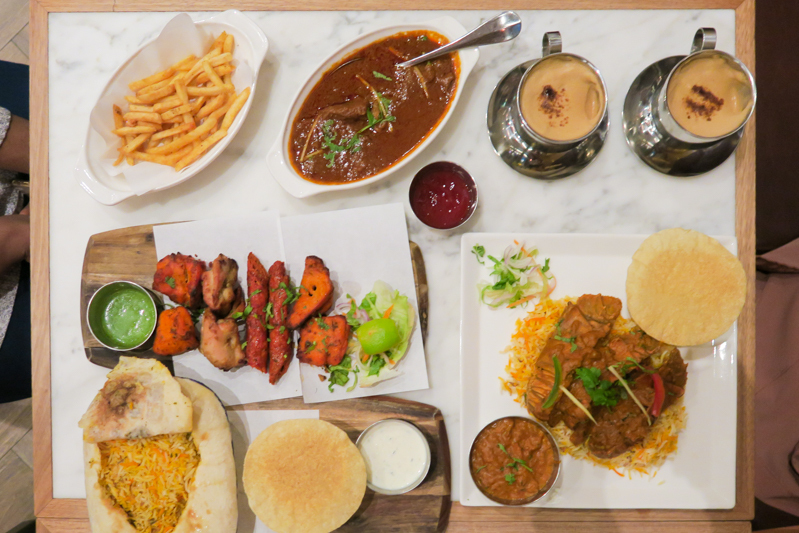 So there you have it, 10 amazing Indian food places you need to eat at in Singapore. I wasn’t able to cover every type of Indian food though, so if you have any other places that you think we need to visit, do mention them in the comments!